The Kora, the clockwise trek around the Kawa Karpo range is a spectacular adventure: The trail leads through different vegetation zones from blooming alpine meadows to thick and species rich forests. Plenty of breathtaking view points allow amazing sights of the snow-covered steep mountains. 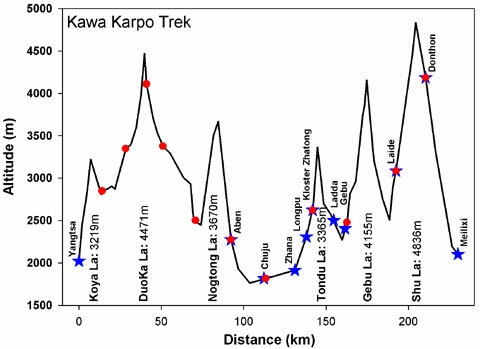 Altitude profile of the Kawa Karpo Trek. Blue: settlements; Red: our camp places. However, the trek requires good physical condition and self-confidence in walking in remote regions on lonely paths. It is a 12-stage tour across six high passes with altitudes way above 3000 m. Most of the time, over-nights are in tents, but sometimes in the settlements it is also possible to stay in private guest houses. Logisitc starting point is the town Deqen in northern Yunnan. You can reach Deqen easily by overland bus from Lijiang or from Zhongdian (Shangrila). The trek itself starts at a suspension bridge across the Mekong in the village Yangtsa (100 km south of Deqen) and ends at the Mekong in the village Meilixi (70 km north of Deqen).